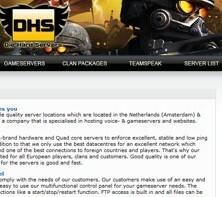 Die Hard Servers only uses A-brand hardware and Quad core servers to enforce excellent, stable and low ping voice- & gameservers. In addition to that we only use the best datacentres for an excellent network which results in low lagfree pings and one of the best connections to foreign countries and players. That’s why our voice- & gameservers are suited for all European players, clans and customers. Good quality is one of our features and our live support for the servers is good and fast.